Served cold from bottle. Pours opaque black with a thin, tan head that dissipates quickly and leaves minimal lacing. I found the aroma to be mostly roasted malts and rum, with very little coconut presence. The taste is rum sweetness up front with a nice dark chocolate flavor that follows and continues through the finish. Lightly carbonated and medium bodied. 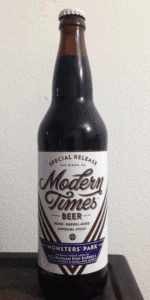 Of the various BA beers I've had from Modern Times I would rank this among the best even after 18 months or however long its been since its release. It's balanced, the barrel is well integrated, and it's very smooth. Love this. Great all around. Smell, taste, and feel are all outstanding. Have had a few of the Monsters' Park variants now, and this is the best one I've come across. Definite must-have. O: A solid coconut beer but nowhere need the best. Thick pour with nice head for a coconut beer. Nose is mostly rum, but pleasant, not harsh. Perfect creamy fuly body mouthfeel with ncredible taste of chocolate-y roasted coconut! TONS of coconut. Liquid Almond Joy comes to mind.